Turnips, members of the cruciferous family of vegetables, along with broccoli, collards, kale and Brussels sprouts, grow in temperate climates throughout the world. Most commonly grown for their white bulbous roots, turnip leaves and sprouts are also edible and highly nutritious. Turnips are a valuable addition to your healthy diet and provide a wide range of health benefits. Turnips can be eaten a number of ways. They can be eaten raw just as you would eat a radish or a carrot or grated and added to salads. Turnips can be roasted, grilled, sautéed, baked or boiled and mashed just like you would make mashed potatoes. In fact, many people boil their turnips with potatoes and mash them together. Turnips are great in salads, casseroles, soups, stews, sautéed as a side dish, or added in a burrito! Their delicate flavor makes them easy to add to many dishes! Health Benefits of Turnips: Turnips are a great source of vtamins A for healthy growth and development, and for good vision. Vitamin C for fighting infections and healing. Vitamin K and Calcium for strong bones. Folate for a healthy brain. Lutein for healthy eyes and heart. Turnip greens have a large amount of calcium for strong bones! Turnips contain a compound which is praised for its cancer prevention properties! Peel, trim and slice the turnips very thinly. I used my mandoline. In a cast iron skillet, melt 2 tbsp butter. Put a layer of turnips on the bottom of the skillet on top of the butter. Season lightly with salt and pepper and add 1/3 cup cheddar cheese and 1/3 cup parmesan cheese. Add a tbsp of butter, cut into small pieces and place on top of this layer. Drizzle 2 tbsp milk over the turnips, top with some fresh thyme. Repeat steps 4-7 until a total of 3 layers are formed. Finish with a cheesy top. Bake for 25-30 minute until bubbly and brown. Combine olive oil, oregano, salt, pepper, grated garlic, lemon juice and zest, and chicken broth. Toss with diced turnips. Sprinkle turnips with paprika, for color. Put them in a preheated oven for 30 minutes, take them out, flip them over and put them back in for another 20 minutes. Cut chicken into 1-inch pieces and sprinkle with ¼ teaspoon each salt and pepper. Heat 1 tablespoon oil in a Dutch oven over medium-high heat. Add the chicken and cook, stirring frequently, until lightly browned, 3 to 4 minutes. Transfer to a plate. Add the remaining 1 tablespoon oil to the pot. Add turnips, mushrooms, onion and garlic and cook, stirring occasionally, until the onion is limp, 3 to 5 minutes. Add wine and cook, stirring, for 1 minute. Stir in kale, broth and rosemary. Return the chicken and any accumulated juices to the pot; bring to a boil. 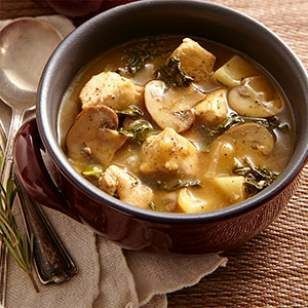 Reduce heat to maintain a simmer, cover and cook, stirring once or twice, until the turnips are tender, about 10 minutes. Meanwhile, mix cornstarch and water in a small bowl. Stir the mixture into the stew and cook until thickened, about 3 minutes. Remove from heat and season the stew with the remaining ¼ teaspoon salt. Be sure to peel turnips well to remove all the thick skin before cooking. To peel, cut off one end to create a flat surface so you can keep it steady on the cutting board. Follow the contour of the vegetable with your knife to remove the skin. Or, if you use a vegetable peeler, peel around the root about three times to remove all the fibrous skin.